I love Valentine’s Day. Not for the holiday itself (which I normally celebrate by finally catching up on my lost sleep) but for the socially acceptable excuse to wear the loudest red colors I can find without looking like an early addition to the Red Hat Society. I’m not doing a full out gift guide this year, but instead I’m taking a different tactic. If you are also into girly red and pink dresses and accessories, this post is for you. I’m spending my Valentine’s Day on a plane heading back from vacation this year, but if I was planning to go out these are some of the things I’d be incorporating into my outfit. My navy version of this from ages ago is still going strong, but I love this even more thematic red version that Bravissimo has released this year. This set is adorable, well-made and a great everyday lingerie set when you need a pick me up during the rest of the year. I’ve been a big fan of Erica M for years, but now that Beyonce is a fan and they’ve been picked up by major retailers I expect to see them everywhere. These fashion forward red tights are an edgy way to complete your Valentine’s Day outfit. I’m a huge fan of Kate Spade everything, so it’s no wonder I like this romantic idiom bangle. It’s thematic but not so showy if you’re having a low key date. If you’re on a budget (like me) and not in a hurry for Valentine’s Day, then it’s easy enough to wait for a flash sale or for the Kate Spade jewelry to show up for much less at the end of the season on sites like Gilt. Check their Facebook page and sign up for alerts on your favorite flash sale sites to stock up on Kate Spade stuff without breaking the bank. 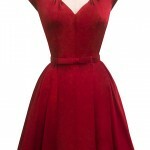 I have this dress both in blue satin and in black cotton. Honestly, the only reason I haven’t bought this version is because I don’t have enough dress up occasions to justify multiple satin dresses. This cut looks amazing on curves and frames full busts perfectly. It’s the perfect night out dress that will turn heads and make you feel like a million bucks. Again, this pair of shoes is not for the faint of heart and probably only for die hard theme dressers. That said, I love them and would absolutely wear them with a nice simple dress to show them off. The heel isn’t even too high for us klutzy people to manage! Kate Spade has recently introduced a new line of cute bags and accessories sourced from female artisans in Rwanda. 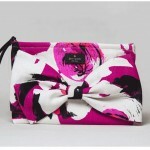 While I love this clutch purely for looks, I also like the idea of doing good with my money at the same time. Do you love dressing up for Valentine’s Day or are you planning on ignoring it? Which item on this list would you incorporate into your wardrobe? Ugh I LOVE that TD dress. I need it!